A couple of weeks ago while I was shopping at Michael’s I made several spur of the moment holiday purchases, including 2 foamy-style rubber-stamp blocks and 3 packages of epoxy stickers. I have no idea what made me pick these items up because I don’t stamp, or use stickers (much). There was just something pretty and tactile about them that made reach out and place them on the check stand. (Actually, I was just going to buy one stamp, but it didn’t have a sku tag, so the checkout girl asked if I could grab another. Then I heard myself saying “I’ll just take that one, too”). Thank goodness they didn’t cost much! So I’ve had these foamy stamp blocks on my desk for a while now. David asked me why I bought them and I guiltily mumbled something about probably returning them, or using them for… something. Later, I found myself tossing one around and noticing how it bounced merrily before settling. Then I thought Eureka! I could design a holiday game for my nephew with it! (Okay, so I didn’t say Eureka!, but that word perfectly described how I felt. As in: Whew! If I can make something useful/fun, then I can be excused for making an impulse buy. After all, it must have been fate at work that day, right?). This picture is misleading. These are the two stamps I bought, but only one is used for the game. How to Play: Here was my thought process. 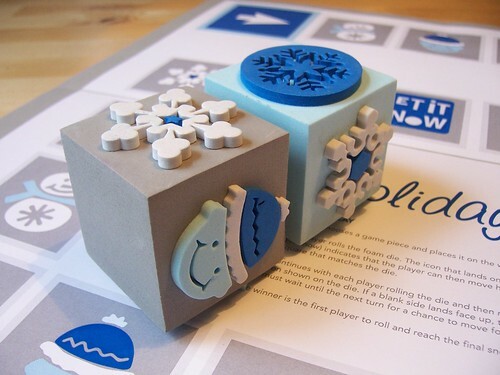 The foamy stamp block would work like a die that you roll (there is a snowman side, a snowflake side, a kid’s face, the words “Let it Snow,” and two blank sides). 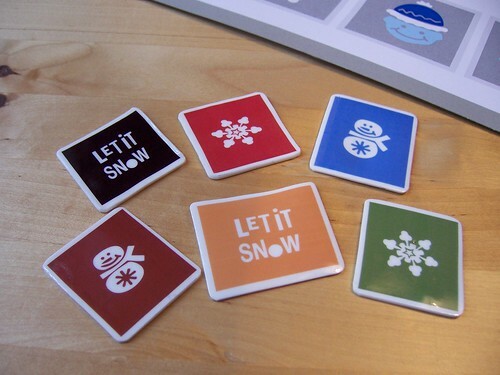 Whatever lands face up is the icon that you’d move your game piece forward to on the board. Sounds pretty easy right? The only kicker is that when you roll a blank side you lose that turn and don’t get to move forward. I designed the whole game board with this idea in mind. I should mention here that I don’t know anything about three and a half year old boys, or any kids at all for that matter (although two of my good friends are now expecting!). Paolo, our nephew, lives in Austin and we rarely see him. I could be totally wrong about skills at that age or his interest in something like this. However, the other night when I explained this game to Marcy, she said it sounded like Candyland, which I looked up and is rated for ages 3+, which is perfect. 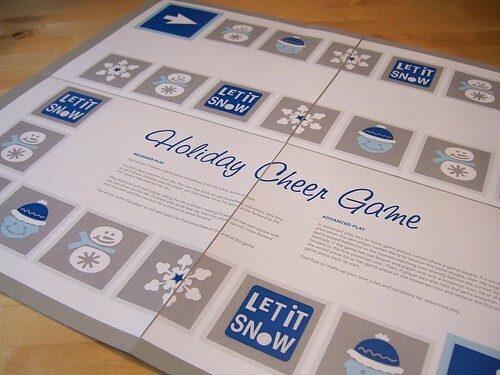 To make a long story short, you can download my Holiday Cheer Game here. It’s pretty large, with a full size of 17 x 22″ so it has to be printed out (or tiled) in four sections if you’re printing it out on regular letter-sized paper, like I did. Then I pasted the sheets to a larger piece of thin cardstock for durability/foldability. These are the simple plastic playing pieces I made . I would have preferred something more 3D, but they seem to work okay. Game Pieces: I made game pieces out of Shrinky Dinks plastic (I am having such fun with that stuff! ), but any small objects will do. Playing pieces from another game, a set of erasers, coins, bottle caps or anything that will fit on the squares should work. Advanced Play: Depending on the level of the players, you can make the game harder by adding additional rules. For example, instead of two players sharing a square, maybe the original player gets kicked off his space and moved backward to the nearest same icon. Or maybe he moves all the way back to start! It’s up to you. This is a wondeful creation! Thank you so much for sharing it. It is creative and looks like it’s as much fun to create as it will be to play the game. SOOOOOOOOOOOOOOOOOOOOO Cute I can’t wait to play with this…..
You are the best! Thanks, this is great! I love boardgames. Wow, I’m impressed. This is a pretty big project! Nice job, and really cute.